1's & 0's in your eyes. Digital Fringe pixels will catch your eyeballs somewhere this festival season. Digital Fringe is the digital arts arm of The AGE 2008 Melbourne Fringe Festival. Digital art from all over the world will be streaming into all sorts of nooks and crannies, across the Melbourne, Victoria & the world. See international emerging artists in your local pub, library, or shops. Have your eyeballs hijacked by MPU's guerilla projections as you wander through the cityscape at night. Four of Melbourne's finest purveyors of lush sounds ranging from smooth liquid triphop, dub and sample based beat landscapes to squelchy, 8-bit glitch unite to deliver a night of synaesthetic delight for your auditory and visual pleasure. V.J. accompaniment by Shower Screens (Gertrude Projection Festival) and Siadatz (Uber Lingua) will be augmenting the multimedia experience of fresh local producers of organic electronic music, White Minus Red, Ionic, Editer and Paranym. Tracts is a group show of sound installations at Melbourne's Blindside Gallery as part of the 2008 Next Wave Festival that examines the role of sound in the world. The exhibition explores how sound can shape our understandings of our surroundings and ourselves, bringing into question the nature of space within a gallery and the role of the subject in experience. 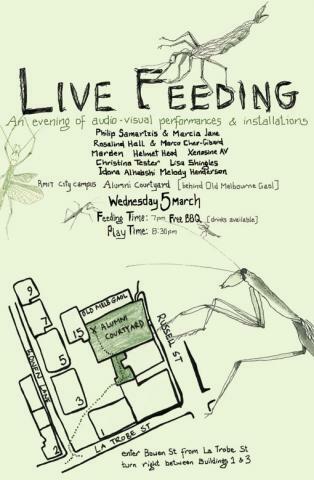 Assembled by several of Australia's premier emerging sound artists, the exhibition invites the audience to enter, surround, and interact with the installations. 16 May - The Reels - LIMITED TICKETS JUST RELEASED! 30 May - Youth Group (NSW) - Selling Fast! 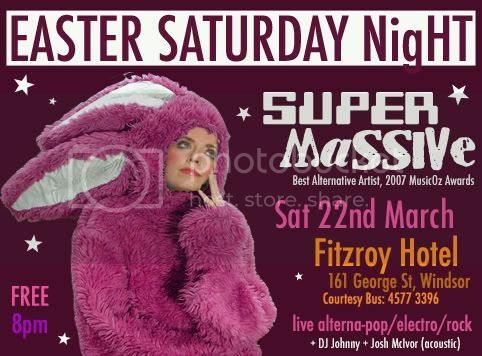 Sydney's ultra groovy, alterna-pop/electro/rock four piece Super Massive bring a lively Easter Saturday night to Windsor, playing a free show at the Fitzroy Hotel on the 22nd of March, 8pm -11pm. Locals can even take advantage of the hotel's courtesy bus, to really make it a rip-roaring night.